Dalton Yap was born in Hong Kong in 1960, and grew up with his younger siblings in a small village near Tai Po in the New Territories. At age twelve, he and his family made Jamaica their new home, first settling in Papine, St. Andrew and then in Mandeville, Manchester where he spent most of his early adult life. At the time of the lawsuit, he was General Manager of Technology and Operations at Jamaica Citizens Bank. 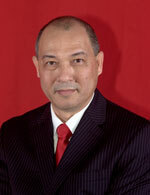 During the trial&apos;s ten-year period, Yap ventured into the manufacturing, restaurant and food retail sectors, and became a successful entrepreneur in his own right. He now lives in Toronto with his wife Pauline and their three children. Alex Lee was born in Portugal in 1966. She grew up first in Kingston, Jamaica and then Toronto, Canada. As a professional writer, much of her work has been for corporate clients. She has also authored and co-authored several mini-memoirs, with A Matter of Conduct being her first full-length collaboration. She is now based in Miami, Florida, USA.